Thornapple Kellogg Middle School recently honored the September students of the month. Pictured in front from left are Drake Holzhausen, Jordan Rowley, Lucy VanDemark, Ailana Leos, Abigail Dumond, Willow Tuffs, Josalyn Cramer, Zoe Boyd (second row) Israel Mendez-Torres, Corbin Clements, Cole Novak, Will Nathan, Blake Hardy, Kendra Coe, Cecelia Essenberg, Zoey Ziny, Erin Chinavare, Emma Dykhouse, Maliah Westmaas, Whitney Ruger (third row) John Wieringa, Grayson Stahle, Haden Bovee, Hope Clements, Hayden Chatman, Anna Niemi and Wyatt Barnes. Not available for the photo was Alexandra Segoviano. 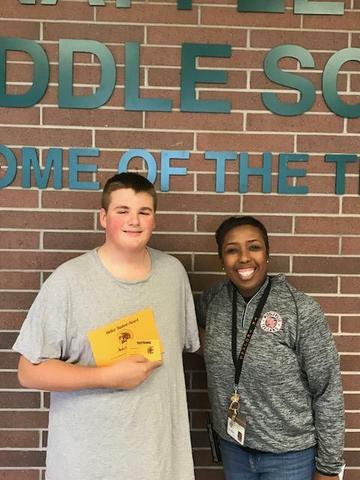 Pictured separately is Andrew Swift with TKMS Principal Kelli Arnold-Wegner.